Last night, I had dinner with my friends Tyler and Jayme and their new baby. b) and easy to add any of recently mooched books back into your inventory for re-giving. The existing “history” page lists books you’ve given away, and then on later pages shows books you’ve mooched. It’s unwieldy, with too much information on it, and not something anyone is likely to check frequently. It was only a few hours work to adapt the existing history page to be a concise “books mooched” page, and so I’ve gone ahead and done Tyler’s suggestion. I’ve also included a “details” page if you want to see book covers and some other info about the book that was mooched. Clicking the “give” button leads you to an “are you sure?” page which explains what you’re about to do, so you don’t get yourself into trouble by exploratory clicking. One thing I need to work on, is the “details” link for mooched books seems to usually give a blank page. That’s not good! I’ll fix that shortly. Thanks Tyler, for the great idea! 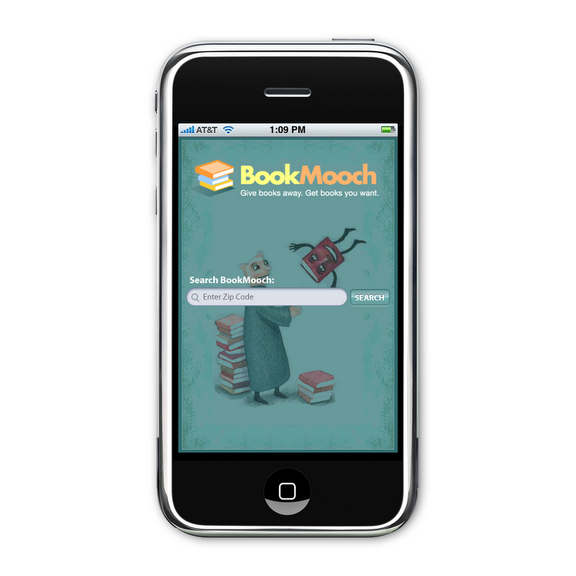 I’ve started working with an iPhone application-writing company to make a BookMooch application for the iPhone. The company (Cadile) gave me a fixed price bid of $2750, which is a really, really good deal, and I think it’s a good way to spend some of the money you’ve given to BookMooch. Their timeline calls for the application to be done within a month, and they’ve been extremely quick to turn things around to me, which is exciting. The “BookMooch iPhone app Design” graphic I’ve attached is something I put together, and I also made some very primitive screen mockups in excel. Those seem like the main things you’d want to do with BookMooch when you’re out and about. Of course, you can also use the BookMooch web site from your iPhone if you want to use features of BM that aren’t in the iPhone app. I’m also hoping that we’ll see some new users from the world of iPhone users joining BookMooch because of this.